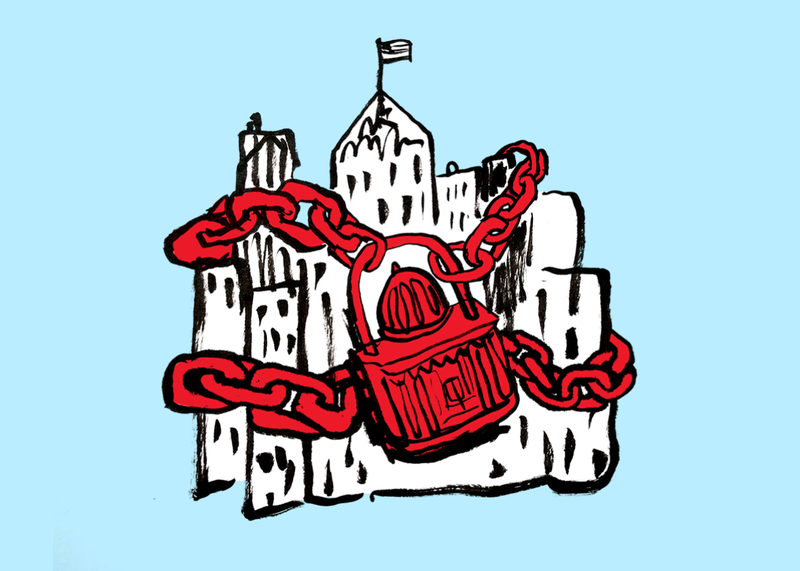 How ALEC, ACCE, and pre-emptions laws are gutting the powers of American cities. Local governments want to set their own minimum wages, gun laws, and smoking bans. And statehouses have methodically stripped away their powers to do so. In May 2011, Wisconsin’s Republican Gov. Scott Walker approved Senate Bill 23, which prohibited the state’s municipalities from enacting paid sick leave laws. From the outside, it might’ve appeared as if he was swinging a sledgehammer at a very tiny nail. While the bill applied to every city, town, village, and county in Wisconsin, only one jurisdiction in the state had a paid sick leave law on the books: Milwaukee, a Democratic stronghold. 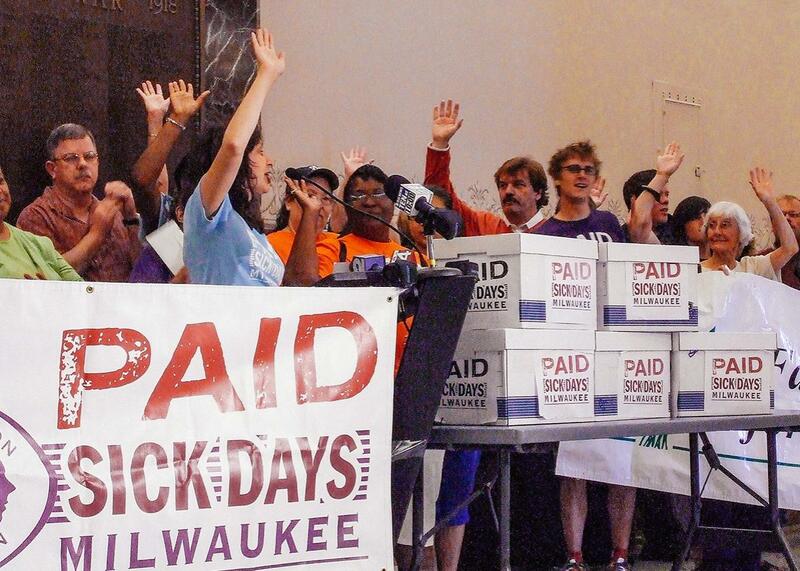 Milwaukee’s ordinance, approved in a 2008 referendum by 69 percent of voters, would have required large businesses to offer full-time workers nine paid sick days a year and businesses with fewer than 10 employees to offer five sick days a year. Ensnared by legal challenges, the law had never taken effect but had been ruled constitutional by the state’s 4th District Court of Appeals in March 2011. Two months later, Bill 23 arrived on Walker’s desk, and paid sick leave in Wisconsin was dead. Bill 23 is an example of state pre-emption, a tactic that has quietly come to exert a powerful influence on American civic life during a time of political impasse in Washington. The federal government sometimes pre-empts state laws—as Congress did in nullifying Vermont’s food-labeling law in July—but more often, pre-emption is a tool used by conservative statehouses to restrict the ability of cities, towns, and counties to chart their own destiny. Remember North Carolina’s HB2, aka the “bathroom bill,” the one that bars places like Charlotte from passing LGBTQ anti-discrimination laws? That is a textbook instance of pre-emption. And Republican-controlled statehouses across the country are deploying the tactic with increasing fervor. To understand how, consider the path that Bill 23 took after Walker signed it. In the summer of 2011, copies were handed out at the annual meeting of the American Legislative Exchange Council, or ALEC, a 43-year-old organization that brings together state legislators and corporate representatives to write cookie-cutter laws for statehouses across the country. Its members include many of the nation’s largest companies, a quarter of state legislators, one-fifth of the U.S. Congress, and seven sitting governors. Since its distribution in the ALEC committee room, along with a U.S. map designed by the National Restaurant Association, versions of the sick leave policy have been adopted in Alabama, Arizona, Florida, Indiana, Kansas, Louisiana, Michigan, Mississippi, Missouri, Oklahoma, and Tennessee. Cities in those states no longer have the right to decide whether the people who work there ought to receive a guarantee of sick time with pay. The Paid Sick Days petition hand-in at Milwaukee City Hall on June 22, 2008. ALEC has successfully pushed pre-emption into more and more areas of GOP policy, from guns and tobacco to sanctuary cities, pesticides, and even municipal broadband. The tactic has consumed state-level lawmaking as American political life has become increasingly polarized between Republican-led statehouses (the most since the 1920s) and Democrat-controlled cities (almost all of the nation’s largest). Thanks in part to ALEC’s promotion of the concept, pre-emption has become the most powerful statehouse tactic of our time. But ALEC’s campaign to reshape the American municipality is no longer just coming from above. Three years ago, the group introduced a subsidiary organization for local politicians, the American City County Exchange, or ACCE. ACCE is taking the fight for the free market directly to the places where conservatives see it flagging: the nation’s regulation-happy cities. It’s far from the only organization that proposes the sharing of policy and expertise at the local level. What’s new is both that ACCE imitates ALEC’s mixed boards of business interests and politicians and that it is nestled within an organization whose urban policy has thus far focused on suppressing local lawmaking—on limited government by force, not by choice. How, from such a position, can the ACCE advocate for the improvement of American cities and counties? The ACCE exists to push a conservative vision at the local level, and it’s clear that’s what some of its members earnestly hope to do. But it also serves to put a willing, local face on ALEC’s efforts to accomplish something more controversial: stripping away the laws that Americans have chosen for themselves. For legislators, it is a vacation (meeting expenses are often subsidized by the corporate sponsors) where men (most of the legislators are men) show up in the morning hoarse from the previous night’s bourbon and cigars. Few of them, in conversations, seemed to be very enthusiastic about Donald Trump, despite favorable speeches by Kellyanne Conway, who is now Trump’s campaign manager, and Indiana governor and vice presidential candidate Mike Pence. Few of them legislate full time; they are lawyers, doctors, and small businessmen who also happen to pull a small salary (between $20,000 and $30,000 a year) for spending some time in the state capitol. They don’t like to think of themselves as politicians. For private-sector attendees, who pay between $890 and $1,400 to attend the three-day conference—or upward of $7,000 for ALEC membership—it’s an opportunity. The event attracts representatives from Harvard Medical School, Anheuser-Busch InBev, and everything in between. I spoke with a dentist from a dental trade association who was hoping that ALEC would adopt a model policy to counter the spread of laws that permit dental hygienists to do basic dental work. It’s a bicameral organization where the public and private sectors share voting power—and a business-first, regulation-averse philosophy of government reigns above all else. If ALEC is the big tent, ACCE is the curious sideshow. The organization is 3 years old and has more than 300 members, though the Indianapolis event drew only a couple dozen. Their gatherings in the JW Marriott’s smaller conference rooms had the easygoing rhythms of a group of friends reuniting, if your friends liked to talk about the power and purpose of local government. It felt like model congress for dads. For the most part, the ACCE sessions were suffused with a kind of hopeful pragmatism, as county executives listened to presentations about heroin treatment, government transparency, and business retention. It was, broadly speaking, a reminder that most Americans want the same thing out of local government—a package of low taxes and reliable basic services—and most local governments want to deliver it. “Municipal governments are about getting stuff done,” said Mark Clear, who serves on the Common Council of Madison, Wisconsin. “You’ve got to pick up the leaves and the trash,” said Charles Tassell, a city councilman from Deer Park, Ohio, a tiny suburb of Cincinnati. “And the police and fire. And almost all municipal governments are under the same fiscal pressure to do more with less,” Clear continued. “Especially as the state keeps going: ‘Here’s more to do, we’re giving you less,’ ” Tassell concluded. In Indianapolis, Mitch Harper, a former ALEC state chairman and current ACCE member, introduced himself as the guy who grabbed the flag from a Code Pink protester the previous week at the Republican National Convention in Cleveland. He told the group how he spearheaded a law to repeal the right of collective bargaining for city employees in Fort Wayne, Indiana’s second-largest city. In the summer of 2014, Harper, then a councilman, cut short his 25th wedding anniversary trip to Canada to return to the city and override the mayor’s veto of the law. His vote was crucial: The council overrode the mayor 6–3 to both ban collective bargaining and pass a right-to-work measure, making Fort Wayne the only right-to-work municipality in the state. After the vote, I told Jon Russell, the head of the ACCE, that I was surprised there hadn’t been more debate—no one arguing that some city (if not their own) might have a higher cost of living than the surrounding state, or serve as a natural laboratory for the policy. “It’s the philosophical thought of all of us that state government is the end all, be all,” he told me. And so it was decided—at a conference that had begun with an exhortation that “those who govern closest, govern best”—that cities should not be empowered to set their own minimum wages. The idea for the ACCE didn’t come from ALEC, but was pitched by Russell, a city councilman in Culpeper, Virginia. He has been ACCE’s only full-time employee. There’s nothing remarkable or innovative about Culpeper, a town of 16,000 people 70 miles southwest of Washington, D.C. But that’s kind of the point: Russell argues that cities are creatures of the state, and subservient except when explicitly told otherwise. Russell’s right about the founders. Thomas Jefferson reluctantly admitted America needed manufacturing centers but never relinquished his moral opposition to the city. That ACCE’s annual award is, like ALEC’s, a bust of our third president is a loaded symbol for the organization’s stance vis-à-vis the metropolis. But the reason we’re having a conversation about pre-emption today at all is that, starting with Missouri’s home rule provision in 1875, states have granted cities a fair degree of autonomy to pass their own laws. Forty-four states have some version of the policy, which delegates significant lawmaking powers to the local level. In Wisconsin, for example, home rule was adopted into the state constitution in 1925, after garnering more than 60 percent of the vote in a 1924 referendum. “There is no doubt then that this home rule amendment will be productive of a large amount of litigation,” the dean of the Marquette School of Law predicted at the time—and so it has. But the fact that home rule (as a law) and Dillon’s rule (as a judicial standard) co-exist in many states has created a legal environment that seems to confound even senior state judges, to say nothing of small-town politicians. “Rampant confusion persists among many local and state government officials, constituency groups, and interested voters about the true nature of Dillon’s Rule,” Brookings Institution researchers wrote in 2003. In some states, the researchers found, state courts changed their reasoning from case to case. That is reason to legislate rather than litigate. In a throwback to the pre–home rule statehouse—when lawmakers had to pass hundreds of special acts for cities and towns—states have increasingly turned their attention to dismantling the policies of a handful of big cities. ALEC has driven that effort, and ACCE is along for the ride. The recipient of ACCE’s first Jefferson bust was John Harkins, who was an ALEC member when he was in the Connecticut Legislature and is now the mayor of Stratford. Harkins, one of ACCE’s first co-chairmen, doesn’t think that setting a minimum wage ought to be a city’s power. One fundamental challenge in assessing ACCE is that it advocates in part for inaction from its members—for fewer local laws, not more. But its influence hasn’t just been measured by model policy. It also fills a void by representing a local, pro-pre-emption perspective in the press: Russell, for example, argues for the state’s supremacy in USA Today and the New York Times. The organization can also play that role for politicians reticent about pre-emption bills’ anti-local bias. Earlier this year, Idaho Gov. Butch Otter received a piece of ALEC model legislation on his desk that prohibited the state’s cities from regulating plastic bags. According to Russell, Otter hesitated to subvert local control—until he saw an ACCE white paper that Russell had written on Dillon’s rule. Otter signed the bag-ban ban this spring, though no city in the state had even contemplated such a policy. 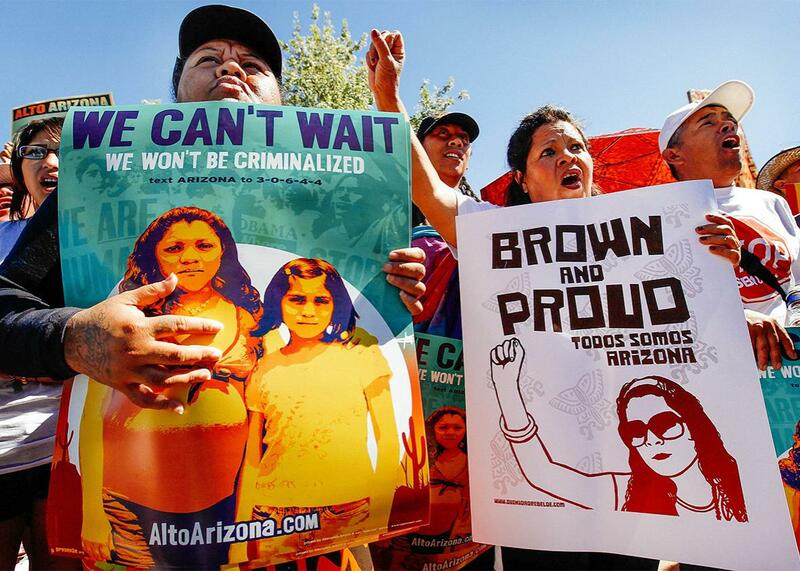 Demonstrators prepare to protest Arizona’s controversial immigration law on May 29, 2010, in Phoenix. A bag-ban ban may not seem very consequential compared with ALEC’s state-level triumphs like Arizona’s immigrant-hostile SB1070—the so-called profiling law requiring police to check the immigration status of many people they arrest. (That was a pre-emption law, too.) The law was partially overturned by the Supreme Court. But then again, ACCE is only 3 years old. Billy Hewes, the mayor of Gulfport, Mississippi, and a former ALEC member, served as a kind of chairman for the group’s proceedings in Indianapolis, and he adjourned the meeting on an optimistic note. Hewes represents ACCE to the ALEC board, reporting on the organization’s progress. ALEC, he told the assembled councilmen, mayors, and county executives, had only a handful of people at its first two meetings. The ACCE already had more than 300 members. Pre-emption is two centuries old, but its practice exploded with the lobbying efforts, through ALEC and other groups, of the tobacco industry, followed by the National Rifle Association. In the early 1990s, as tobacco bills were handed out at ALEC conferences and new legislators were greeted with free cigarettes, states were passing dozens of tobacco pre-emption bills a year. The Consistency in Firearms Regulation Act, a onetime ALEC model bill that abolishes local gun laws, was to some extent “the model of models,” for today’s pre-emption policies, explained Lisa Graves, the executive director of the Center for Media and Democracy. One reason guns and cigarettes were a focus of pre-emption bills, of course, was that those were issues that cities, towns, and counties were concerned about. More than 1,000 American communities had local smoking ordinances by 1995. Cities would act; states would counteract. To some extent, that pattern has continued. Cities that push their own minimum wage laws are reacting to inaction in the statehouse—and sometimes, a local initiative can inspire likeminded action from the state, as happened with New York’s prekindergarten plan, or California’s plastic bag ban, or indoor smoking bans. But more often these days, gestures of urban autonomy inspire a Wisconsin-style backlash. When voters in Austin, Texas, decided in May to uphold a mandatory fingerprint background check for Uber and Lyft drivers, a state senator from outside the city announced plans to pre-empt it in the statehouse. The bill was a classic ALEC gesture in the defense of a uniform regulatory environment, crafted at the state level. But pre-emption extends far beyond ALEC. Arizona has pre-empted the power of Phoenix to stop pet stores from selling dogs bred at puppy mills. In a rush of spring pre-emption bills, Kansas banned local incentives for markets or stores in food deserts and prohibited local governments from enacting inclusionary zoning laws (which set aside low-income housing in new developments), though that had only been “informally discussed” among Lawrence officials, according to the Lawrence Journal-World. “Every single provision of this bill is an attack on local control,” Boog Highberger, a representative from Lawrence, told the paper. “Every single part of this bill impacts actions that have been taken in my community, by our local elected officials, to try to improve the lives of our citizens.” That kind of pre-emptive pre-emption—the state equivalent of “don’t even think about it”—has proved popular elsewhere, too. In addition to Idaho’s pre-emptive bag-ban ban, Mississippi rushed through a law banning soda bans, though no local jurisdictions had discussed any such law. Arizona has prohibited cities from enacting “employee scheduling” laws, though no jurisdiction had compelled businesses to give their workers advance notice about shift changes. Pre-emption laws, or at least their second-order effects, aren’t always free-market- or business-friendly. As the National Basketball Association’s decision to pull the All-Star Game from Charlotte following the passage of the North Carolina bathroom law (which was not an ALEC initiative) demonstrates, big business actually favors laws protecting transgender individuals’ rights to use whatever bathroom they’d like. Arizona’s SB1070 immigration law—whose profiling components were overturned by the Supreme Court, but whose pre-emption aspects stand—led to consumer boycotts. The cutting edge in pre-emption is to attack local finances. Pennsylvania’s Act 192—which was overturned by the state’s Supreme Court in July—opened up municipalities with gun control laws to lawsuits from outside groups. Arizona has enacted a similar law to counter Tucson gun control provisions. And this spring, Arizona Gov. Doug Ducey signed a bill that aims to prevent pre-emption disputes from even occurring. Under the new law, Arizona cities—which don’t have taxation powers of their own—would lose state funding for services like police and fire if they pass a law that the state attorney general deems in conflict with state regulations. Cities often lose legal battles over pre-emption, but such a financial threat could make it infeasible for cities to fight for their citizens’ rights in court. And so Republican-dominated statehouses remain the principal venue for crafting and dismantling urban policy in the United States (and amid Washington’s gridlock, a huge chunk of policy, period). At the local level, that approach has found little organized support outside of ACCE. It’s the rare organization whose members assemble to devise ways to limit their own influence, the capacity of their peers, and the power of their constituents. They do, of course. An institution nestled under the wing of a pre-emption powerhouse like ALEC could never be a good-faith advocate for the welfare of the American city. Clear was on the road back to Wisconsin, and talking like a man who had spent the week watching the construction of a backward-firing gun.